In 2003 I ran the Los Angeles Marathon. I wanted to do it once. I wanted to have run a marathon. I don't have a runner's build, stride, or foot strike, but I have a runner's mind. I did it because I thought I could- so therefore I did. Today while deep in the thick of it I realized, Moming is so much harder than a marathon. 26.2 miles is a CINCH in comparison. First of all- the marathon was over in 5- maybe 6 hours? I can't remember- I wasn't running to make good time. I was running to train and to finish. During the marathon there were people on the sideline cheering me on. People I didn't even know. Suddenly I understood why I could have elected to add my name to my runner's bib. Go yellow! Go 16717! Oh wow- that's ME. They were cheering for ME. It made my feet hurt less and made me runner faster. There were sponsors giving out cooling leg spray and goo and sports drinks. As soon as I finished there was the kindest person who placed a warming foil blanket around me because they just knew despite my run I would suddenly freeze and get the chills and barely be able to stand. Moming means you are on 24 hours EVERY DAY. And on active duty for about HALF of those hours. A 6 hour run? That's sissy stuff. In Mom'ing people crawl and climb up your legs- NO ONE is spraying them with cooling spray. In Mom'ing kids cover you in goo. No one is giving you Protein goo for energy. During the marathon you can go pee ALONE. You get a free massage. You get your picture taken wearing a fricking medal. And at the end of a day of Moming NO ONE is cheering or massaging or gooing or spraying or medaling me. Ever. And we get up the next day and do it all over again. So- here is a cheer from me to you. Store it up for when you need it next. GREAT JOB YOU! YOU!!! The working Mom!!! I won't allow you to feel guilt today because you are AMAZING!!! And-the stay at homer with the dirty shirt and bottomless cup of coffee! And YOU! the one that barely slept and ate the cold macaroni and cheese, left over gold fish and a Hershey kiss for lunch. You- the unshowered mess with hobo looking clothes while your child is dressed cute enough to be a GAP model. WOOO HOO!!!! GO YOU!!!!! You are AWESOME!!!! Tonight I was sitting at the kitchen table cutting hundreds of flash cards I had laminated for Greyson's Behavior Therapy. I LOVE laminating more than a human probably should. The machine just smells so good and everything is so organzied and symetrical and protected and then I get to CATEGORIZE them. Giddy I tell you. Doodle was climbing all over me. He was so mad I wouldn't give him the scissors and he kept trying to grab them from me while I was cutting. He was climbing on top of the table, throwing food down to the dogs and throwing my finished cards onto the floor and bending them. And then he kept trying to climb ON TOP of my head which he always tries to do. I snapped. I picked him up and put him on the floor. UGHHHHH!!!!! Take him!!! I hissed to Michael. HE IS BEING SO ANNOYING. He won't stop touching everything ALL DAY. He took off his diaper and pee'ed on the carpet earlier. And while I was cleaning that up he pulled the entire toilet paper holder off the wall and put the toilet paper roll in the toilet. And then he TOOK OFF HIS DIAPER during his nap and POOPED ALL OVER HIMSELF. And he tries to play with scissors and soft scrub with bleach (don't ask) and I need you to take him away from me. I finished cutting the cards and look up to see Parker handing Michael his work gloves and looking up expectantly. Dipity dip dot dot doo? He says in Minion speak to Michael- which clearly means Put on the gloves, Daddy. I place my hand over my heart and sigh, He is so adorable, I say to Michael. Wait- which is it? Is he annoying or adorable? He asks confused. I laugh- I had already forgotten that exchange from just five minutes earlier. I guess both, I told him. And that right there just sums it all up. Everything I love about Life. Sweet and salty. Excrutiating and exquisite. Annoying and adorable. Dangerous McDoodle with a pry-bar and sledge hammer. We are finally getting rid of our disguisting DNA filled carpet. 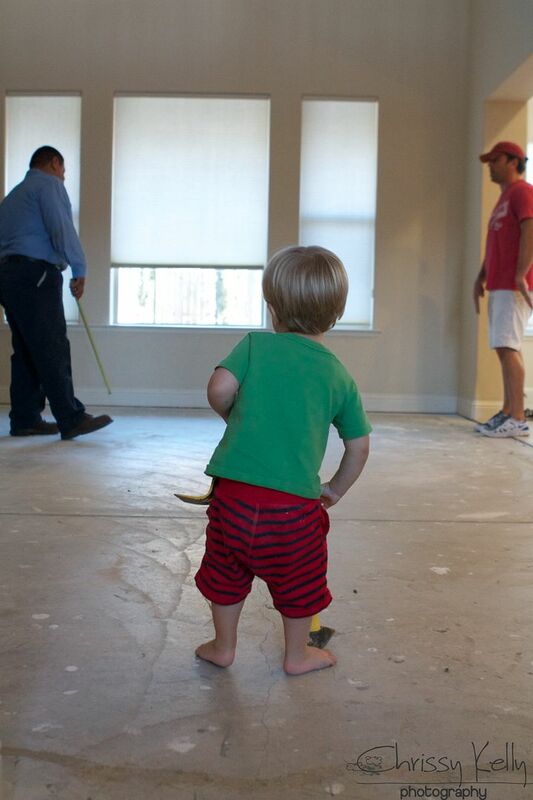 And Uncle Frankie even stopped by after work to help because he is seriously handy. We got to see him twice today on Trash Truck Wednesday. Thanks for helping, Frank! 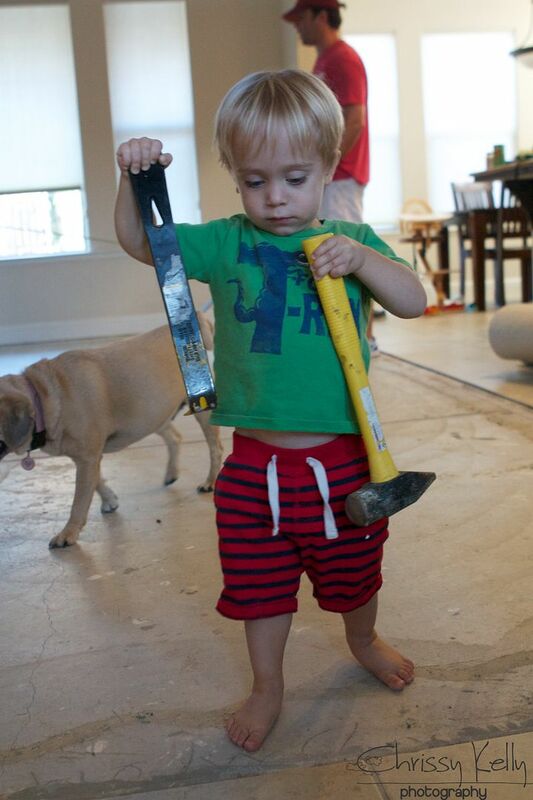 Clearly Parker has what it takes to be a handy man. Thank you for letting me be BRAVE with you. Not a polite- thank you, but a big bear hug jumping up and down THANK YOU. It's funny- I swear I love you the way you are. I love when you are honest and real and flawed with me. When you tell me your truth I think you are brave. But sometimes I wear a mask, a mask I never know I have on until after I take it off. Sometimes we have no choice but to be strong. But sometimes- I feel weak and everything is too hard and I am scared about everything- but mostly scared that I will always feel that way. I don't usually dive into it because I have conditioned myself to stuff it down to survive. But there is a blurry line between strong and stuffing. For me- the sharing of the stuffing felt gross and weird and like the right thing to do. Call it a funk or mild depression or a rough patch. Everyone has them to varying degrees. I have them too. And after a post like yesterday's I check comments with one eye shut- waiting for someone to say- Get it together. Man up. Stop whining. Or-- You should really seek help. You are dangerous over the top crazy. Which is really just the mean voice in my head telling me all of those things already. So how can I tell you it's okay to be imperfect when I don't allow myself the same? So I try it when I realize I am doing it-stuffing- and I was doing it. And talking about it is sometimes scary and feels weird which means that it's working. For me- part of finding my happy when I've lost it includes an honesty in admitting when I'm unhappy. Talking about my feelings comes naturally to me. And it gets easier and less yucky the more I talk about my not shiny feelings. I grew up exposed to depression early on- and when I'm in it personally- its horribly scary & it feels like life will always be hard, but it's also not very scary and comfortable and normal all at the same time- and something that many of us go through from time to time. Like a cold. Not to belittle it because I've only experienced it in occasional waves of mild. And you should (but not should because that's a bad word) totally try it-being honest about how you feel if you are in a funk- instead of feeling compelled to answer, Fine, when someone asks how you really are. It's such a relief. And it's okay to be imperfect. And yes, I'm talking to me. I barely rarely okay- never have it ALL together. And the most together I am is when I know I don't have it all together and I'm perfectly fine with that. In FACT, that actually is the key element of having it all together- admitting you don't have it ANY of if together really. Total chaos is the new all togther I say. Amen and High Fives all around. Thank you! Thank you for letting us in each day and sharing your honesty with us. We can all do this together. And, thanks for sharing Parker's plumbers crack. too cute! Beatiful words yet again! Love to read "real" every morning with my coffee. And I'm in the process of laying new floors, too! Hang in there - chaos can be great! Loved it, as usual! I remember my Sociology teacher from high school saying that babies and toddlers were created so adorable and irresistible to counteract how annoying they could be, how exhausting. True!!! Lol. And I too love to laminate! yes, lady, yes. amen and HIGH FIVE! I am not okay this week- stupid mysterious insomnia- and I'm ruffled and wrinkled and messy and pigpen-like. I am also more nervous than is natural over taking snack to my son's preschool class this morning. What the hell am I afraid of? Do I think the 2 year olds are going to judge my grapes? I will leave you with that awesome sentence. If my husband had read the last part of your post, he would be totally confused, but I totally get it, in fact, it makes me understand me better. Your writing of Doodle made me laugh out loud today! So cute! People are so much more real on the internet...Thank you for your realness. Thank you for sharing what autism is all about...Thank you for sharing how you feel because I have the same feelings as I struggle with my own challenges...Thank you for showing me how to be more real and for even just reminding me to be real so that someone else will feel the freedom to be real too. And with that release will probably come some peace. It has happened for me anyway;hope it does the same for others!Love the previous commenter's remark,"Do I think the 2 year olds are going to judge my grapes? I get nervous about snacks too! Best phrase I have heard in a while....I will think of this today as I try to take conference calls while entertaining 2 little boys at home. Thank you!! 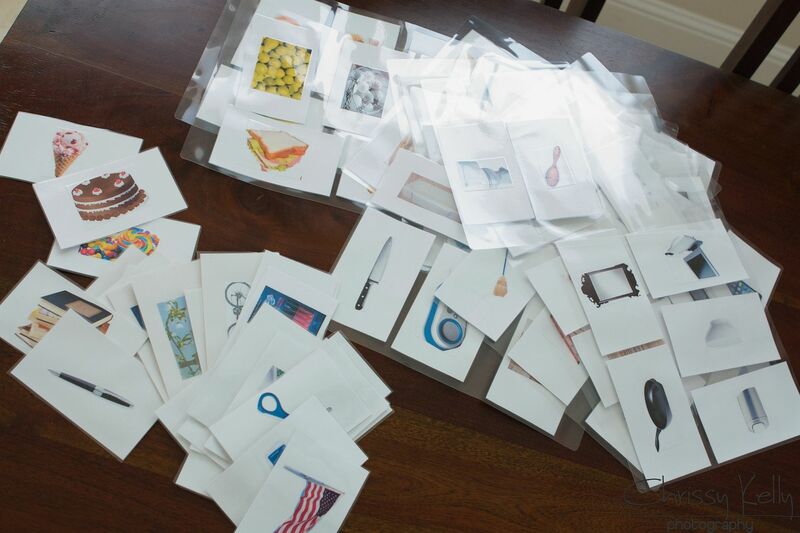 I am happy to find out that you also love to laminate - so do I! The "handy man" photo made me laugh out loud. Thanks for starting my day off with a laugh. The pictures you post bring such life to your blog. I relate to you because I used to call my oldest (now 12) Doodle. Your journey sounds similar to mine with my youngest son who's seven. I don't know if there ever comes a feeling of mastering the journey but you seem to be managing with great strength. "Sweet and salty. Excrutiating and exquisite. Annoying and adorable." SO TRUE. That whole paragraph/experience. I've so been there. You don't whine, you're real! I enjoy your post every day. Ok, maybe a bit more when my daughter is in them, but every single day!